The other day I was prowling through Nessa's things. Well, I saw a book that she had and begged to get to read it. Of course Nessa being my bud and all she was willing to let me borrow the book. But, it was one she had for a book review. I offered to do a guest review if I could read it before her. Nessa conceded. The book? "Religions of the Stars" by Richard Abanes. Now I have always been interested in different religions even though I am a Christian. I wonder what other people believe and why? And of course some of them can be pretty far fetched in my opinion. Now why would I want to read this particular book. Well I have read before about Scientology and Kabbalah and was surprised that people actually bought into these beliefs. This is two of the religions discussed in the book by Richard Abanes. Other religions are Wicca, Mormons, Buddhist and New Age Beliefs. Again I have read about many of these but still wanted to explore further. 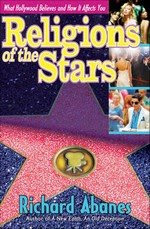 "Religions of the Stars" is broken down by each belief system and a major star that is a proponent of that religion. For example I always assumed that Oprah Winfrey was a Christian. Here I learn quite different. She practices New Age beliefs and they are quite different from my own. I was surprised to find that some people think that they control their own salvation. Now I agree we have choices in our personal beliefs but I don't think I have the ability to "save" myself. I have had family and friends before that are from different ideologies. Learning more about Mormons, Wicca and Buddhism from them. Here in "Religion of the Stars" I was able to explore even more. The book was written in plain language that I could understand. Differences were pointed out in how each religion and Christianity differed. And how many mirrored the same beliefs and teachings too. Most surprising was the religions of Scientology and Kabbalah. Amazing that people can really be reasoning and still "purchase" these religions. Yes, purchase is the right words. In order to advance in these religions you have to pay for each step up. Yeah! Odd in my opinion. Also there are sci-fi stories to explain our origins in Scientology. Yeah, we came from outer space. Well some people believe this. In Kabbalah a simple red string bracelet can keep evil from you. Hey, I have several different colors of string...does it have to be red? If these things surprise you then take the time to read "Religion of the Stars" and judge for yourself. I know it was very enlightening for me. Again, thanks Nessa for letting me read this book. And here you can have it back now.